Carnival Cruise Line has recently been voted the #1 cruise line for its sailings to the South Pacific from Cruise Critic Cruiser’ Choice! 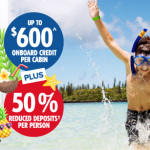 There’s no better way to celebrate, than with a #1 TO THE FUN sale, giving Aussies the incentive to book their next fun filled adventure to the South Pacific with $600^ onboard credit per cabin + 50% reduced deposits† per person. This promotion is only available to book from today until 17 December 2018 on sailings between 23 November 2018 and 30 December 2019. Aussies can take advantage of this amazing deal and choose to cruise to a number of beautiful destinations in New Caledonia and Vanuatu. For more information and to book visit your travel agent, carnival.com.au or call 13 31 94 and quote promo code RDD. Terms & conditions apply.